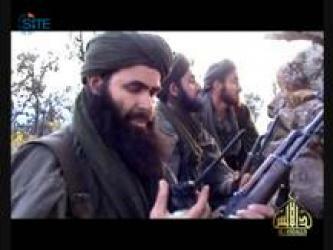 The Mali-based al-Murabitoon, the group of Mokhtar Belmokhtar, declared in an audio speech its joining al-Qaeda in the Islamic Maghreb (AQIM). Al-Qaeda in the Islamic Maghreb (AQIM) released an audio speech from its leader, Abu Musab Abdul Wadud, announcing the joining of the Mali-based al-Murabitoon, and declaring that the raid on the Radisson Blu Hotel attack in Bamako was the first demonstration of this unity. 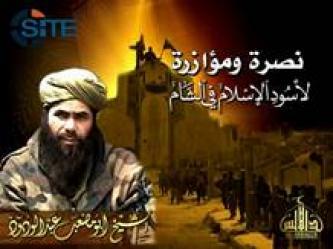 Nokhba Jihadi Media released a strategy paper from July 2012 addressed from al-Qaeda in the Islamic Maghreb (AQIM) leader Abu Musab Abdul Wadud to Islamist groups in northern Mali. 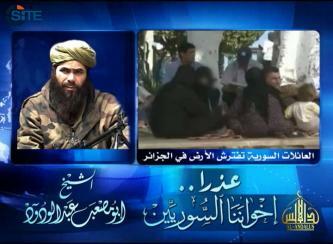 Al-Qaeda in the Islamic Maghreb (AQIM) leader Abu Musab Abdul Wadud challenged France and African states in the Sahel to intervene military in northern Mali, stating in a video speech that it is prepared for war, and urged Malian Muslims to support the "Islamic project" under the Ansaruddin Movement. Al-Qaeda in the Islamic Maghreb (AQIM) leader Abu Musab Abdul Wadud urged Malian Muslims to reject foreign intervention in their country, and charged French President Francois Hollande with "digging the graves" of French hostages. Al-Qaeda in the Islamic Maghreb (AQIM) released an audio speech from its leader, Abu Musab Abdul Wadud, condemning the Algerian government for its alleged maltreatment of Syrian refugees, and apologizing on behalf of Algerians. 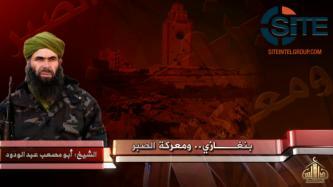 The third group of answers given by Ansaruddin spokesman Sanda Ould Bouamama to questions asked by jihadists about the movement and its aims and relationships, focused on specifics about the group's area of control, issues with countries neighboring Mali, and the possibility of foreign intervention. 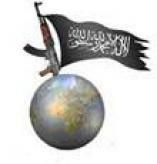 Al-Qaeda in the Islamic Maghreb (AQIM) leader Abu Musab Abdul Wadud gave advice to fighters in Azawad, an unrecognized state in northern Mali, regarding how to best govern the area in accordance with Islamic Shariah. 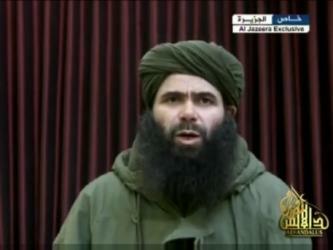 Abu Musab Abdul Wadud, the leader of al-Qaeda in the Islamic Maghreb (AQIM), urged Algerian Muslims to boycott the coming Algerian legislative elections and begin a "comprehensive" revolution inclusive of jihad. 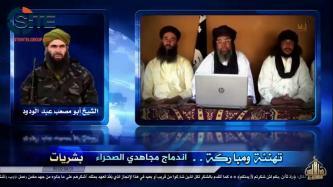 Abu Musab Abdul Wadud, the leader of al-Qaeda in the Islamic Maghreb (AQIM), congratulated Libyan rebels for their success against Muammar Gaddafi and their taking the capital, Tripoli, in an audio speech released on jihadist forums on October 2, 2011. A jihadist gave advice to al-Qaeda in the Islamic Maghreb (AQIM) leader Abu Musab Abdul Wadud to setup al-Qaeda cells in Libya and Sinai, and ultimately make his way to Israel. 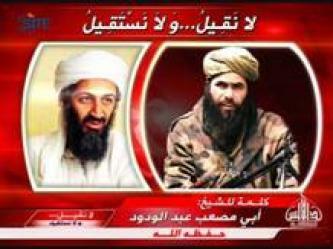 Al-Qaeda in the Islamic Maghreb (AQIM) released a two-part video showing some its military operations in Algeria and Mali, including a raid in which AQIM leader Abu Musab Abdul Wadud participated, and claiming a spiritual role in the Arab Spring. 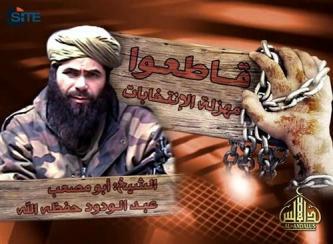 Abu Musab Abdul Wadud, the leader of al-Qaeda in the Islamic Maghreb (AQIM), reaffirmed his group’s solidarity with Libyan rebels in an audio speech released on jihadist forums on March 17, 2011. 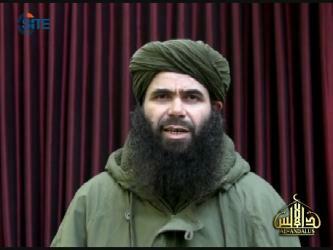 Al-Qaeda in the Islamic Maghreb (AQIM) leader Abu Musab Abdul Wadud addressed an audio speech to Algerian protestors, congratulating their taking action and likening their cause to that of AQIM. 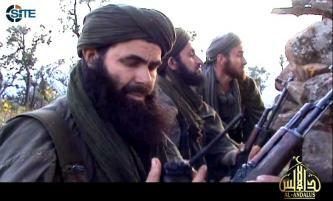 Al-Qaeda in the Islamic Maghreb (AQIM) reported 19 attacks by its fighters in Algeria and denied reports of the deaths of its fighters and its leader, Abu Musab Abdul Wadud, in a communiqué issued on jihadist forums on January 7, 2011.